This review is based on a pre-release version of the book supplied to the reviewer for an honest review. Author Bryan Wilton is a member of the AFA (Asatru Folk Assembly.) On the first page of his book, he states that his motivation for writing it was frustration with people sharing things about Loki on social media and his desire to tell other Asatruars that they should not toast Loki or honor him. Wilton cannot accept that other people are on a different path than him and that their way might be right for them. Wilton uses the word “ego” a lot in this book. That is a term from psychology. The author posits that the “entire pantheon of the Aesir represents aspects of ourselves[. ]” This indicates that Wilton is examining the gods from a perspective of Jungian psychology, treating the gods as archetypes. Wilton calls Lokeans, and other Asatruars who honor Loki among the Aesir, “fringe,” which is historically and culturally inaccurate. The Ásatrúarfélagið, which is the official Asatru religious organization in Iceland, lists Loki among the Aesir. Even Snorri Sturluson, the collector of lore who published the Prose Edda around 1220 and who is the most anti-Loki of all the historical sources, wrote that Loki was counted among the Aesir. Hostility toward Loki is an American phenomenon that has made few in-roads among traditional heathens in Europe. Wilton uses the word “evil” to describe Loki. This is a common mistake among those who have not thrown off their Christian baggage, and insist that pagan pantheons must include a Satan figure. The author states, “he is not willing to make the personal sacrifices to earn his way into Asgard.” In the story of the forging of Thor’s hammer, Loki pledged his head to have Thor’s hammer made. He managed to turn the bargain from losing his life to having his lips sewn shut, but that is still a significant personal sacrifice, especially for a god nicknamed Silvertongue. In the story of the building of Asgard’s wall, Loki risked his body sexually for the gods and was used by a horse, which was culturally considered a dishonor to him. What other god has risked and sacrificed so much for others? The sacrifice of Tyr comes close, having given up his hand, which disqualified him from being king. Still, that was only one sacrifice, not many sacrifices. The many self-sacrifices of Odin were made to increase his own wisdom and magical power, not for the sake of others, unless one counts the sacrifice of his son Baldr (a point of view Wilton does not even mention; he accepts uncritically Snorri’s view that Loki was to blame for that and that Loki was bound in punishment for that.) Freyr gave up his sword to win a bride, so, that also was not a sacrifice made for others, but made for himself. The author’s contention is not supported by the data. The author presents the story of the two goat-eating children as a negative outcome for the children and their family. He characterizes the children’s being chosen to serve Thor as “enslavement.” He contends that by entering the service of Thor the children are not receiving a higher calling, but are stopping their development and becoming less than what they could be. Whatever one thinks of Loki, characterizing Thor as an enslaver who does evil by stunting his followers’ personal growth is a very strange idea. This is especially odd as the author then mentions theosophy approvingly, quotes Christ’s dictate to “deny yourself,” and also cites Buddha in support of the idea of suppressing the ego. Yet, he thinks serving a god is inherently wrong. In the chapter on Loki’s children, Wilton cites Voluspa, the Prophecy of the Seeress, with no mention of the fact that parts of it are borrowed from the Book of Revelations. All the written Eddas and Sagas were written down in the post conversion era, and scholars must take that into account. Regardless of how much of Voluspa is authentic heathen material, the story of Loki’s children within it is an example of a self-fulfilling prophecy. Prophecy tells the gods that the Fenris Wolf is destined to destroy, so they trick him, chain him, and drive a sword through his mouth, and it is no wonder that after that he does indeed grow angry and take his revenge, as would anyone else from the era in which the story was written. Wilton contends that Loki’s children turn out bad because Loki is a bad father, passing down his own psychological faults by failing to teach the Nine Noble Virtues. Leaving aside that the Nine Noble Virtues were invented by Odinic Rite in 1971 in imitation of the Ten Commandments of Christianity, there is no support for that contention anywhere in the lore. It is not Loki who is rejecting and physically abusive towards Loki’s children. The story of Fenris and Jormungandr is a classical tragedy, the tragic hero is not Loki but Odin, and the tragic flaw is knowing the future and thinking it can be changed. The literate medieval Christian who wrote down this story was no doubt familiar with classical tragedy. The concept of ego is an alien one to impose on a medieval epic. The section on Hel is better than the rest of the book. It shows the influence of the excellent academic paper The Road to Hel: A Study of the Conception of the Dead in Old Norse Literature which is listed in the bibliography at the back of Wilton’s book. I would really recommend reading The Road to Hel instead of the digested version in Wilton’s book, though, even though The Road to Hel is long and written at a college reading level. In the chapter on Hel, the illustrations in Wilton’s book are appropriate to the subject matter, unlike the uncaptioned landscape photos that appear in the rest of the book for no apparent reason. Wilton correctly notes that Christianity changed the word Hel to Hell and that the Christian Hell is a different kind of place than the heathen Hel. The heathen Hel is a comfortable place for Baldr, and other dead people, and although some evil people may suffer, the realm of Hel itself is not generally a place of torment, just the state of death. The author uses the phrase “sins of the father,” a quote from the Bible, although he does not attribute it. He uses the saying, “He who conquers himself, truly conquers,” which is a quote from Lao Tzu, although he does not attribute that, either. On the positive side, the author does have nice things to say about Thor battling Jormungandr the Midgard Serpent, and about Tyr. The author says, “Tyr’s courage is to be much respected and praised for he has left the family and his mothers’ skirts far behind[. ]” Considering that earlier, the author said it was wrong for the goat-eating children to leave their parents’ household to live in Asgard, that is a little inconsistent. The author acknowledges that Sleipnir, the eight-legged horse, is good. However, Wilton contends that the story of Sleipnir is another indication of Loki’s bad character because Loki assumed a female form. At last, we have encountered an authentic Viking Age social attitude. Too bad it’s transphobia. The author contends that Loki’s motive for arranging the death of Baldr is being angry that someone better than himself exists. There is no mention that Loki is not described as becoming angry until he sees the gods mocking death by throwing spears at Baldr after he has become invulnerable, which is an unnatural state of being even for a god. The story of the gods throwing spears at Baldr could be interpreted as a mock sacrifice that turns into a real one, which is a type of story known in the ancient world. The entire sequence of the story of Baldr’s death from his bad dreams, through the protective actions of his mother that sought to avert the known future, through his eventual death through an action that would not have taken place without the protective actions, can also be read as classical tragedy, the tragic flaw again being knowing the future and thinking that it can be changed, which brings it about. Either of those interpretations would be ideas familiar to the poets who actually composed the stories we have written down. About the part of the story where Loki becomes a crone to find out what Baldr’s Achilles’ heel is, Wilton writes, “to counter it [the protection on Baldr] he must become something he is not, a woman. Deceit on this level can only be labeled as evil.” Again with the transphobia. If the author were to make the claim that the people who wrote the story would have seen transsexuality and unmanliness as socially undesirable, that would be a true thing to say for the most part, although assigning those characteristics to a god speaks of a society evolving toward something better, but that is not what the author says. He just says it’s wrong; it’s his own opinion. The author goes on to attack not just Loki, but Lokeans, saying that their existence is bad for Asatru. He says, “human groups behave at a level that is much more primitive than the individuals that comprise it. This phenomena is how group evil becomes promoted, we saw it with Hitler, Custer, King David, Charlemagne, so on and so forth. Instead of building esprit de corps in the group, they find a common enemy and atrocities no individual could commit become commonplace among the collective to justify a position that avoids spiritual growth.” Yet, he does not see that that is precisely what he is doing: he has chosen an enemy to attack, Loki and Lokeans. Instead he ascribes the behavior he is engaging in to the Lokeans he is attacking. Wilton quotes the entire text of Lokasenna. There is no doubt that some of the content in Lokasenna is nasty, and I don’t fault Wilton for finding the dialogue offensive. Wilton disagrees with others’ interpretation that the purpose of Lokasenna is to show that the gods have flaws just like we humans do, and I can’t fault that either, since structurally Lokasenna really seems more like it was composed for the twin purposes of preserving knowledge about the heathen gods while presenting an acceptably anti-heathen attitude to pass in what was then officially Christian Iceland, and to show off the poet’s skill, although Wilton does not mention either of those purposes. Like all the literature written down in the Christian era that was an attempt to preserve oral traditions, Lokasenna is problematical from the point of view of filtering authentic heathen material from Christian influence, although Wilton does not say that either. Wilton’s interpretation of Lokasenna is that in this story Loki is a bad example of how to act, and I can’t say he’s wrong about that. Lokasenna is not a guide to proper behavior. 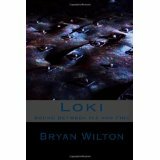 Wilton promotes the idea that Loki is not really Odin’s blood brother, but his foster son. That shows the influence of Marvel Comics. Wilton writes, “Each of the Aesir and Asynjur are powerful enough to squash Loki in an instant, but they do not, the sacrifices they have made to establish themselves where they are would be marginalized if they had fed into Loki’s sickness. They are above that.” That is reaching for a complex psychological explanation when there is a simple cultural explanation: they are in the feasting hall. They can’t initiate violence in the feasting hall. The culture that created the poem Lokasenna was the culture of the Viking Age poets who sang of the heathen gods overlain with the culture of the Christian ruling class of a few centuries later that still observed the custom that one should not engage in drunken brawls in front of one’s king. The bibliography in the back of the book is remarkable for showing where the author’s ideas came from, although he does not list Carl Jung. The Prose and Poetic Eddas are listed. The Road to Hel is listed, and that is no doubt why the author’s chapter on Hel was more accurate and contained more authentic heathen thought than the other chapters, since “The Road to Hel” is a work of scholarship. The other two books listed are the theosophist book The Masks of Odin, and People of the Lie, a book by Christian psychiatrist Scott Peck, winner of the Community of Christ International Peace Award for his books on applying the Christian concept of evil and sin to psychiatry. Although I have spent most of this review excoriating this book, I do have one good thing to say about it. It could have been worse. Wilton does not make any arguments from racial originalism. The book is free of overt racism.